The currency was originally known as the tical; this name was used in the English language text on banknotes until 1925. 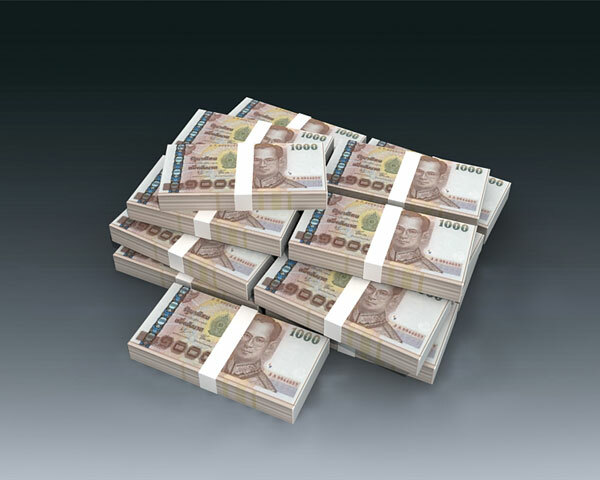 However, the name baht was established as the Thai name by the 19th century. Both tical and baht were originally units of weight and coins were issued in both silver and gold denominated by their weight in baht and its fractions and multiples. Front: Portrait of H.M. King Bhumibol Adulyadej (Rama IX), the reigning monarch, in the uniform of the Supreme Commander of the Armed Forces; The Privy Seal (radiant crowned Chakra seal on platform). Back: His Majesty King Bhumibol Adulyadej (Rama IX) performing royal activities; Pa Sak Jolasid Dam; Watermark: Portrait of H.M. the King and the classical Thai design "Phum Khow Bin"